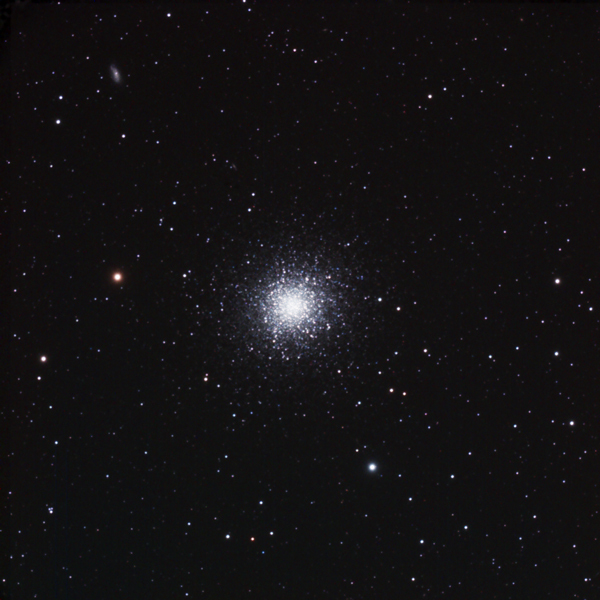 Messier 13 (sometimes called the Great Globular Cluster in Hercules) is a globular cluster of about 300,000 stars in the constellation of Hercules. M13 is about 145 light-years in diameter, and it is composed of several hundred thousand stars, the brightest of which is the variable star V11 with an apparent magnitude of 11.95. M13 is 25,100 light-years away from Earth. on first night high clouds. Saturation and Brightness level adjustments. since the processing was carried out in a non-calibrated laptop monitor.